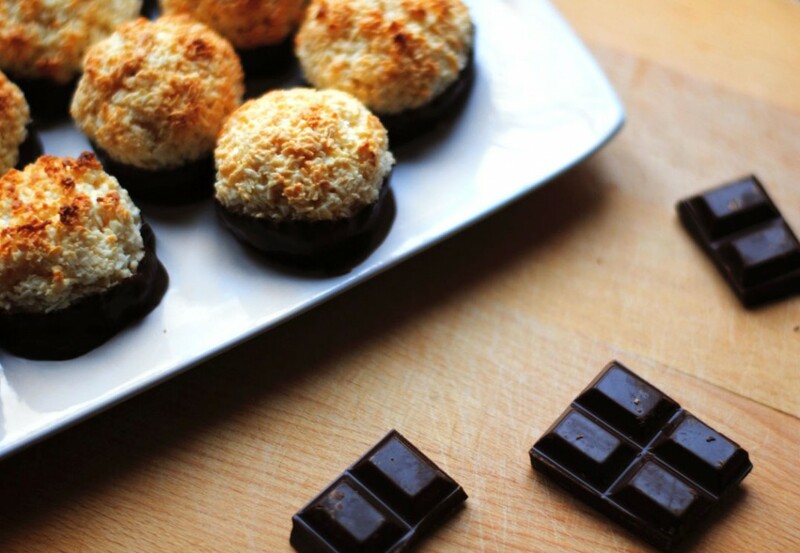 These coconut macaroons are crunchy on the outside, perfectly moist and chewy on the inside, and as if that weren’t enough, they’re dipped in super dark chocolate. People sometimes ask me how I can bake so much without overdosing on cookies, cakes and brownies. I always tell them the same thing: I share! I might make a batch of 40 cookies, but I only eat a few of them myself. The rest go to friends, family, coworkers, and neighbors. This week I was craving coconut macaroons, but I’m also making an effort to eat healthy. So, I made them right before we hosted a party at our apartment. Great strategy, right? Wrong, because these cookies are too good to share. I had one (ok, two) and the party guests gobbled up the rest like the greedy little cookie-hoggers that they are. I mean, really. The nerve. Anyway, lesson learned. Next time, make one batch of cookies for my party guests and one batch of cookies to eat in my pajamas while watching Netflix. These cookies are quite large. Make them smaller if you like, but be careful not to overcook them or they'll be quite tough! 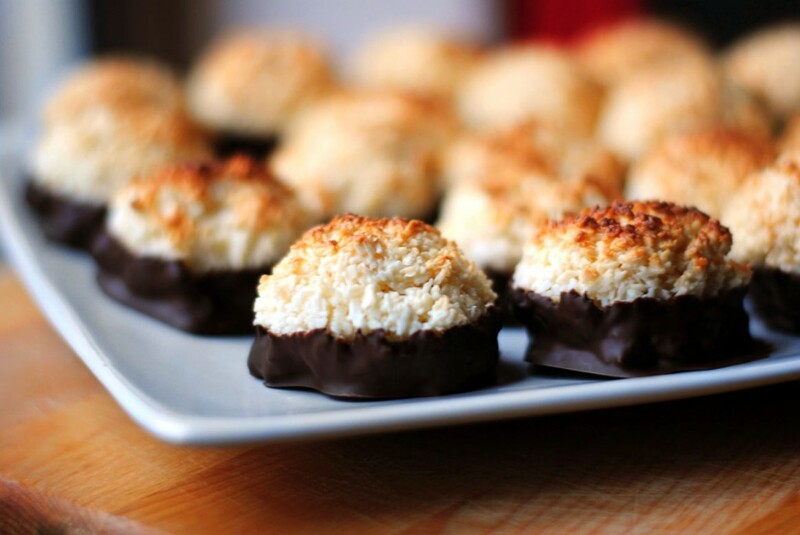 Also, I used small coconut flakes because that's all I could find in London, but a larger flake would also be delicious. I wouldn't use the extra fine ones because it would affect the consistency too much. I prefer to use unsweetened coconut because the sweetness from the condensed milk is plenty for me. However, if you have a major sweet tooth, I think the sweetened flakes would work fine in this recipe as well! Preheat oven to 350ºF/175ºC. Line a baking sheet with parchment paper. In a large bowl, mix together flour, coconut and salt. Add condensed milk and vanilla extract and mix until coconut mixture is thoroughly moistened. Use two soup spoons or an ice cream scoop to place dough on prepared baking sheet. Cookies should be slightly larger than a golf ball. Bake for 12-15 minutes or until coconut is toasted. Remove from oven and let cool completely. Melt chocolate in a double boiler and stir until smooth. Let cool slightly, then dip the bottom of each cookie in melted chocolate. Let the chocolate cool and harden on a baking sheet lined with parchment paper. Stick them in the fridge if you're in a hurry!